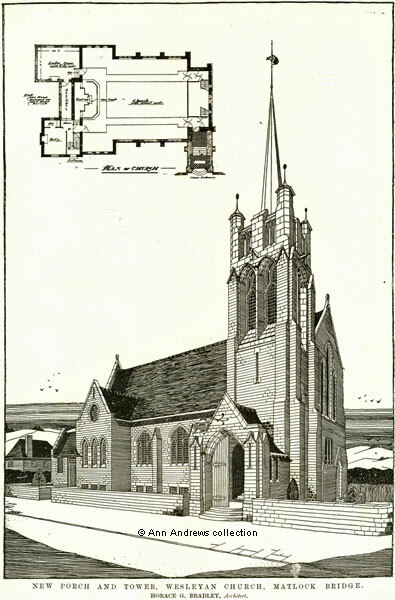 The design for the new porch and tower of the Wesleyan Methodist Church at Matlock Bridge was published in "The Building News" on 23 Feb 1906. The architect was Horace George Hayden Bradley, a young architect from Wolverhampton. 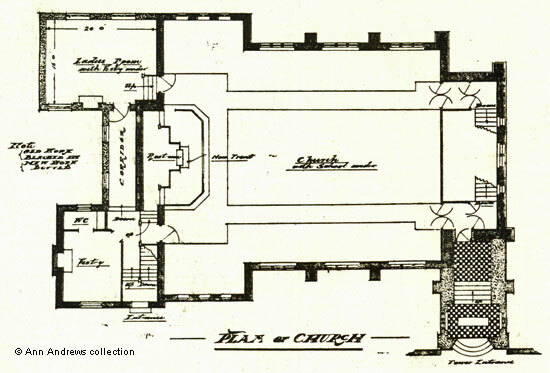 The black outlines on the floor plan below denote the original building and the greyish/mottled lines indicate the 1906 additions. A Ladies' Room with a vestry underneath was to be added to the south east corner, with access from the entrance on the north east corner on Oak Road via a new corridor. The main entrance was to be through the porch attached to the Tower entrance on the north west corner. The original church had not included a spire, but one was now added to the top of the new tower. In the same year both ministers changed. John Woollerton moved to Hinkley and was replaced by a new superintendent, George Harbottle, who moved from Dunstable where he had been for four years. "He dated from 1871". The local paper stated that "This is an exceptionally good appointment to Matlock", although it is unclear whether it was a good move for Rev. Harbottle personally or that Matlock itself would benefit. The other minister appointed was Harry G. Tunnicliffe, B.A., a junior minister from the training college. The month of August saw an annual exodus of Wesleyan Methodist Ministers and in 1906 some 800 ministers and their families moved to new circuits in readiness for worship on the following Sunday. It was estimated that £12,000 was spent annually on these removals. A Methodist conference not long before had appointed a committee to see if the outlay was justified. Matlock Wesleyan Chapel on Bank Road became the Trinity Methodist Church and is now known as Matlock Methodist and United Reformed Church. "New Porch and Tower, Wesleyan Church, Matlock Bridge". The Building News, 23 Feb 1906. H. G. H. Bradley was born in Wolverhampton in 1878, the son of the professor of music Frank Henry Bradley and his wife Harriette Sophia (from 1891 census). By 1901, when he was 23, he was an architect's assistant and ten years later he had become a Manager for an architect. "Derby Daily Telegraph",Thursday 30 August 1906. "He dated from 1871".